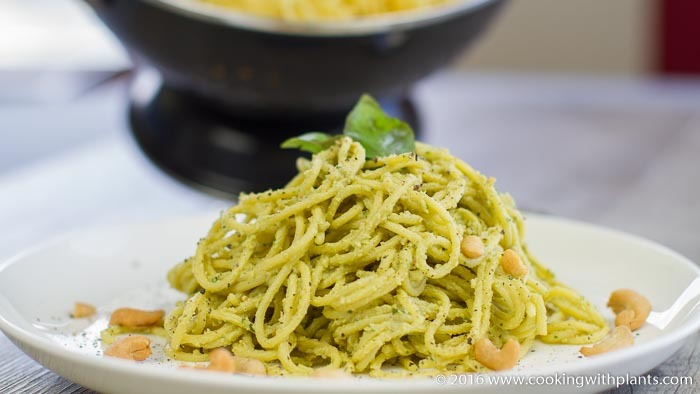 This no oil Avocado Cashew Pesto Spaghetti is a real crowd pleaser. So easy to make and tastes aboslutely amazing! Best of all it is dairy free and 100% plant based! Watch the video above for the full instructions on how to make this super tasty dish. Great for lunch, dinner or any time you want something filling and delicious. This is popular with both young and old alike. Enjoy! Place all ingredients (except spaghetti) in a food processor and process for 10 seconds. Scrape down sides and process for another 10 second. Mix the creamy pesto mixture through hot cooked pasta and add a splash of hot water or vegetable broth if you want the sauce a little bit thinner. I like it as is so that it really clings to the pasta and has maximum flavor. Anja, so glad to have you back! I’ve missed your wonderful recipes. I’ve been hungry for pesto and have mixed it with quinoa lately, but I also love, love it with pasta. Thanks for the recipe! Thank you. I think I could use one-quarter of this recipe for 400 grams spaghetti. Otherwise it was very good. I can see that :), it was very good all thick and gooey… yummy…. Anja I did this great recipe yesterday. I love quick recipes! I liked the taste but something was bitter, do you have this as well or do you think I did something wrong? Maybe the lemon I used? Thank you, I would love to retry it! I’m not sure why it would taste bitter. Maybe the avocado wasn’t ripe??? I don’t think so, the avocado was perfect. I will try again, maybe less lemon or basil. Thank you! Just made this and it’s fantastic. There are lots of vegan pesto recipes on the web and most are pretty ordinary…this one is by far the best I’ve tried. Really creamy and tastes great! I like this best when it is fresh. I try not to keep it in the fridge longer than a day or 2. My husband (not vegan yet) and I had this for dinner and it was so fresh and full of flavor for both of us! The next day I had it for breakfast, had some of it as a dip as a snack, and used the rest of it in a big bowl of hot spinach with chili flakes and olives for dinner. Thank you much and it will be a staple in my house! I found your page the other day and have tried this recipe yesterday, my avocado was not ripe yet but it still worked! I was surprised how good it tasted, I will definitely put this one on my weekly menu!! I will try the rice paper rolls tonight! I have tried different vegan recipes but always found that they taste very boring, Im so glad I have found you! I haven’t seen any typical german recipes yet, rotkraut or something (sugar free). Just putting up an idea 🙂  Thumbs up for all your work!! Anja, I am originally from Italy and we love pesto. I made your recipe last night and I did half cashes and half pine nuts as that is what we generally use for Italian pesto. Even without the olive oil and slithers of parmegiano reggiano (parmesan) it tasted EQUALLY good. The texture and flavors were delish so I was overall very pleased. I adore this recipe. I already had a cup+ of vegan parmesan that I had made with the cashews, yeast flakes and some garlic and sea salt, so i got to skip the adding of those ingredients. I juts used my ready made parmesan that I keep on hand..I used a handful of dry basil from a jar and it was delicious. Thick is best. Someone mentioned a bitterness and I wondered if it might be the stems from the basil that were blended in if they used fresh basil. Anja, I love you site and i use your videos often. Looking forward to trying the Garbanzo bean omelette in a few weeks when i can get over to the Asian grocery for their vegan ham slices. Thanks for all you do!!! Absolutely delicious, there is nothing else to say but YUMMY.